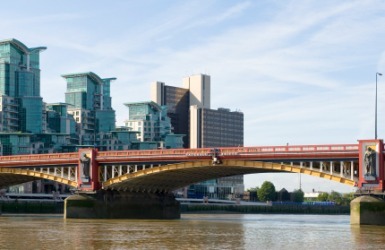 The Vauxhall Bridge in London. Bridge is defined as the bony upper part of your nose. An example of the bridge of your nose is the place where your glasses rest on your nose. The definition of a bridge is a structure connecting two sections of land so that people and vehicles can cross from one side to the other. The Golden Gate bridge in San Francisco is a famous example of a bridge. "bridge." YourDictionary, n.d. Web. 23 April 2019. <https://www.yourdictionary.com/BRIDGE>. a similar support for the strings of a piano, harpsichord, etc. Something resembling or analogous to this structure in form or function: a land bridge between the continents; a bridge of understanding between two countries. A fixed or removable replacement for one or several but not all of the natural teeth, usually anchored at each end to a natural tooth. Nautical A crosswise platform or enclosed area above the main deck of a ship from which the ship is controlled. a. A long stick with a notched plate at one end, used to steady the cue in billiards. Also called rest 1. Chemistry An intramolecular connection that spans atoms or groups of atoms. To build a bridge over. To cross by or as if by a bridge. Middle English brigge from Old English brycg ; see bhrū- in Indo-European roots. A construction or natural feature that spans a divide. ​(anatomy) The upper bony ridge of the human nose. Rugby players often break the bridge of their noses. (dentistry) A prosthesis replacing one or several adjacent teeth. The dentist pulled out the decayed tooth and put in a bridge. (nautical) An elevated platform above the upper deck of a mechanically propelled ship from which it is navigated and from which all activities on deck can be seen and controlled by the captain, etc; smaller ships have a wheelhouse, and sailing ships were controlled from a quarterdeck. The first officer is on the bridge. (music) The piece, on string instruments, that supports the strings from the sounding board. (billiards, snooker, pool) A particular form of one hand placed on the table to support the cue when making a shot in cue sports. (billiards, snooker, pool) A cue modified with a convex arch-shaped notched head attached to the narrow end, used to support a player's (shooter's) cue for extended or tedious shots. Also called a spider. Anything supported at the ends and serving to keep some other thing from resting upon the object spanned, as in engraving, watchmaking, etc., or which forms a platform or staging over which something passes or is conveyed. (wrestling) A defensive position in which the wrestler is supported by his feet and head, belly-up, in order to prevent touch-down of the shoulders and eventually to dislodge an opponent who has established a position on top. A connection, real or abstract. ECMO is used as a bridge to surgery to stabilize the patient. (computing) A device which connects two or more computer buses, typically in a transparent manner. This chip is the bridge between the front-side bus and the I/O bus. (communication) A system which connects two or more local area networks at layer 2. The LAN bridge uses a spanning tree algorithm. (chemistry) An intramolecular valence bond, atom or chain of atoms that connects two different parts of a molecule; the atoms so connected being bridgeheads. (electronics) An unintended solder connection between two or more components or pins. (music) A song contained within another song, often demarcated by meter, key, or melody. The lyrics in the song's bridge inverted its meaning. (graph theory) An edge which, if removed, changes a connected graph to one that is not connected. (poetry) A point in a line where a break in a word unit cannot occur. (diplomacy) A statement, such as an offer, that signals a possibility of accord. A low wall or vertical partition in the fire chamber of a furnace, for deflecting flame, etc. ; a bridge wall. A solid crust of undissolved salt in a water softener. To be or make a bridge over something. With enough cable, we can bridge this gorge. To span as if with a bridge. The two groups were able to bridge their differences. (music) To transition from one piece or section of music to another without stopping. We need to bridge that jam into "The Eleven". (computing, communication) To connect two or more computer buses, networks etc. with a bridge. (wrestling) To go to the bridge position. From Middle English brigge, from Old English brycġ (“bridge”), from Proto-Germanic *brugjō, *brugjǭ (“bridge”), from Proto-Indo-European *bʰerw-, *bʰrēw- (“wooden flooring, decking, bridge”). 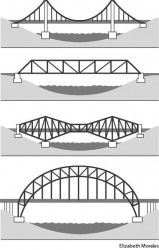 Cognate with Scots brig, brigg, breeg (“bridge”), Saterland Frisian Brääch (“bridge”), West Frisian brêge (“bridge”), Dutch brug (“bridge”), German Brücke (“bridge”), Danish bro (“bridge”) and brygge (“wharf”), Icelandic brú (“bridge”) and brygga (“pier”), Gaulish bríva (“bridge”), Old Church Slavonic бръвъно (brŭvŭno, “beam”) and Russian бревно (brevnó, “log”). The verb is from Middle English briggen, from Old English brycġian (“to bridge, make a causeway, pave”), derived from the noun. Cognate with Dutch bruggen (“to bridge”), Middle Low German bruggen (“to bridge”), Old High German bruccōn (“to bridge”) (whence Modern German brücken). (card games) A card game played with four players playing as two teams of two players each. Bidding is an essential element of the game bridge. Name of an older card game biritch, probably Russian бирич (biríč) - OED, or probably from Turkish bir-üç, "one-three". A simple, protocol-specific device that interconnects two or more links in a circuit, reading the destination address of an incoming data frame and forwarding to the next link in the direction of the target device. A bridge also acts as a repeater, amplifying, reshaping, and retiming the input signal. A bridge does not perform complex processes on the data frames, and neither does it attempt to evaluate the network as a whole to make end-to-end routing decisions. A simple, protocol-specific device that interconnects two or more segments in a local area network (LAN), or two or more LANs of the same architecture (e.g., Ethernet-to-Ethernet).A bridge reads the destination address of an incoming data frame and forwards it to the next segment in the direction of the target device. A bridge also acts as a repeater, amplifying, reshaping and retiming the input signal to extend the physical reach of the LAN. Bridges operate at the lower two layers of the OSI Reference Model, providing Physical Layer and Data Link Layer connectivity. Specific bridge protocols include source routing protocol (SRP), source routing transparent (SRT), spanning tree protocol (STP). See also architecture, circuit, Data Link Layer, encapsulating bridge, filtering bridge, frame, LAN, link, OSI Reference Model, Physical Layer, protocol, repeater, router, self-learning bridge, SRP, SRT, and STP. (1) To cross from one circuit, channel or element over to another. (3) A device that connects two LAN segments together. Bridges are inserted into the network to keep traffic contained within the segments to improve performance. By monitoring which station acknowledged receipt of the address, bridges learn which nodes belong to the segment and maintain their own address tables. Multiport bridges have more than two ports and perform a switching function like a LAN switch. Bridges Vs. Routers Bridges work at the non-routable data link layer 2 and are not concerned with the network protocol (typically IP). Routers work at the routable layer 3 and inspect the network protocol. 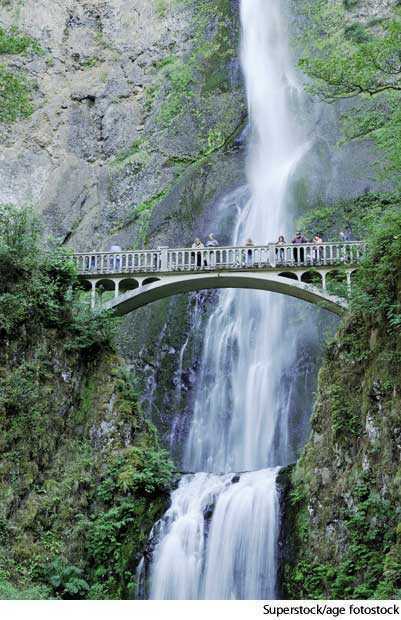 Since bridges do not have to glean routing information, they are faster than routers. A type of bridge that connects disparate networks, such as Ethernet and Token Ring, is called a bridge router. See LAN, transparent bridge, repeater, router, gateway and hub. The upper bony ridge of the human nose. The part of a pair of eyeglasses that rests against this ridge. Within two hours, the bridge was passable. The 1862 bridge burned and was painstakingly replaced in 2001. "We.ve crossed this bridge before," she assured her. They were close to her condo; she drove the massive Sky Bridge every day to get to work. "Water under the bridge," he answered.